Q How Long Do I Have To Wait For My Boxes After Placing An Order? Not long! No one likes to be kept waiting. So we get your boxes to you as quickly as possible. During checkout, you'll see an estimated ship date. This is a preliminary date, which assumes that your proof acceptance occurs within 24 hours and that your order doesn't have unusual requirements. This date may be updated when you approve your proof. We do our very best to make these estimates as accurate as possible, but they are ultimately only estimates. If you are working toward a critical, hard deadline, please contact our Customer Support team as early as possible in the planning process so we can work with you to meet your needs. After placing your order, you should receive a digital proof within 24 hours. You can make changes and go through as many proof rounds as you need to get your box design the way you want it; you can cancel your order during the proofing cycle if necessary. 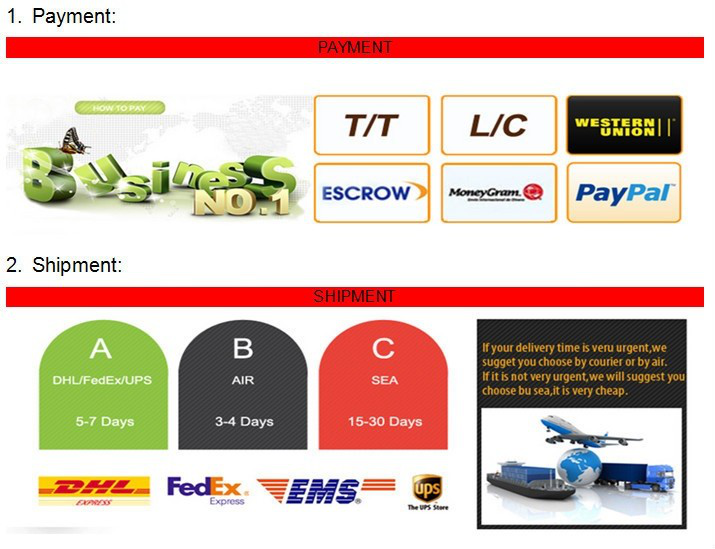 Production turnaround refers to the time after you place your order until it is shipped, not including shipping transit time, which you select during checkout. Production turnaround times are highly dependent on selections you make for box size, quantity, and materials. Expedited production may take as few as 8-10 calendar days from proof acceptance until we ship. Not all orders qualify for expedited production. If your order qualifies, you'll see the option available during checkout. Standard production times generally range from 10-20 calendar days after proof acceptance. Shipping transit time depends on where you are in the USA. During checkout, you'll see an estimate of ship time to your location when you fill in your shipping address. If you select Expedited Production, we strongly recommend that you also select an Expedited Shipping Method. Q What Choices Affect My Pricing? Q Can The Wholesale Price Be Discount? A You get what you pay for. We always keep our products and quality first. Our prices are factory price, eliminating the Middle link of buyers. Directly access the factory price, mutual trust, win-win situation! Q Are You Able To Test My Products When They Are Returned? A We are able to perform certain quality control checks on returned items. For more information, please contact your sales representative. Q Do You Insure My Inventory In Your Warehouse? A Because our client’s inventory remains in their possession, we do not insure their inventory while in our warehouse. We can provide an insurance company to speak with if our clients are interested in taking out a policy on their insurance. Q How To Choose The Box That Meets My Requirements? A We advise that before you place an order, you know what you need the box for. It also helps when you know what you're going to put inside the box or who its for. We’re sure that in our catalogue that’s always increasing, you’ll find the most adequate model for you. When you’re browsing our website, be sure to read more information on the boxes and the tips we give, for example: inner and outer measurements, difficulty assembling level, approximate assembling time, weight a box can carry etc. We’ll surprise you for sure! Q How To Order EECA's Products? A 1.Choose products you need. 2.Inquire to us(quantity size, material,surface / logo disposal). A Samples within one week. The goods need 10-25 days，up to order quantity. 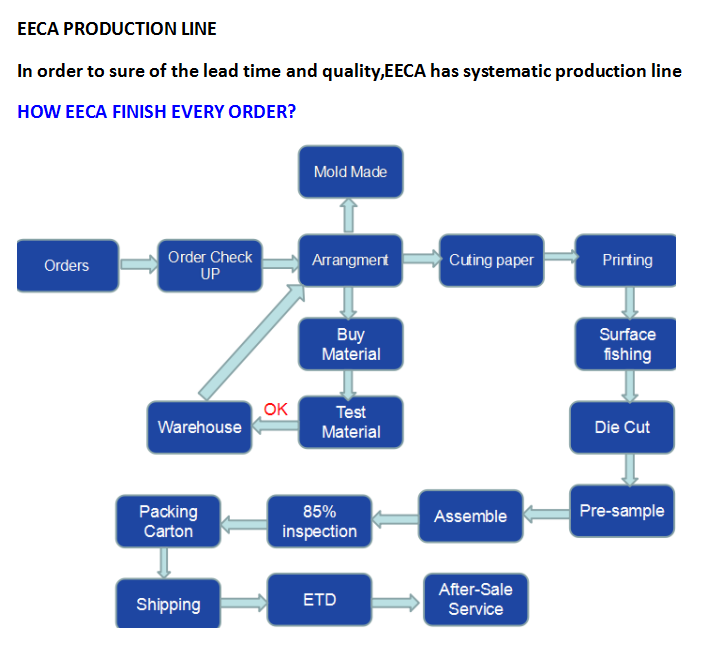 EECA production line in order to sure of the lead time and quality,EECA has systematic production line. Q Do You Accept Custom Design? A Yes,ODM and OEM are welcome. Q What Is The Paper Box Size? A We do customized products,any size we can make according to your requirement.so the paper box size is decide by you,as you may know,different size have different price,please kindly let me know,what size will your requirement? If you no idea of box size,we can suggest size to you also. Q How & When Could I Get The Quotation? As most of our products are customized,we could do simple design for you freely.And any customized design welcome. Usually,about 1-2days,you will get the quotation from our engineering dept. Q How Long Would I Get Sample? Resolution:no less than 120DPI,the higher,better. A Mass production need 7-15 days. A We accept T/T, Western Union, Paypal,L/C. A Deposit 30% before production, the balance 70% paid before shipment. Q How To Get The Sample From Factory? How About Sample Fee? A You can get free sample in our stock but freight collect. For the sample fee is base on your design, if the qty is so big and reach our target, then we can refund the sample charge to you bulk production. A No matter what kinds of product you want, if you want to know the price quickly, please provide the following information: material, thikcness, size, color, quantity .Or you can send us your original sample if you have.